Stewart Campbell (born 7 November 1972 in Glasgow , Scotland) is a former Scottish international rugby union player who played for Glasgow Caledonians (now Glasgow Warriors). He played in the Lock position. He started playing amateur rugby for Strathendrick RFC. Moving through amateur clubs he played for West of Scotland, Dundee HSFP and Melrose RFC. 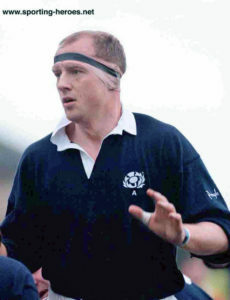 When professional rugby started in Scotland in 1996, Campbell first played for the Caledonia Reds. On their merger with the Glasgow side he then turned out for Glasgow Caledonians in 1998. He then played for Treviso in Italy before moving to England to play for the Leicester Tigers and then Yorkshire Carnegie. He played for Scotland at various age grades, the Club XV side, the ‘A’ side and the Scottish national team.